I love the American Tobacco Trail. Almost every weekend you can find me or someone in my family out walking or biking on it. 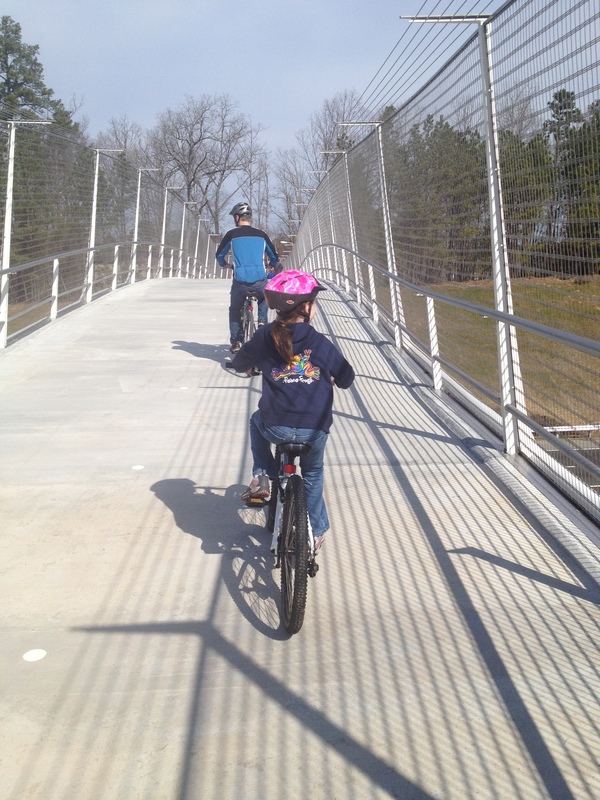 Like many trail enthusiasts, I anxiously awaited the opening of the American Tobacco Trail’s bridge over I-40 by Southpoint Mall in Durham. 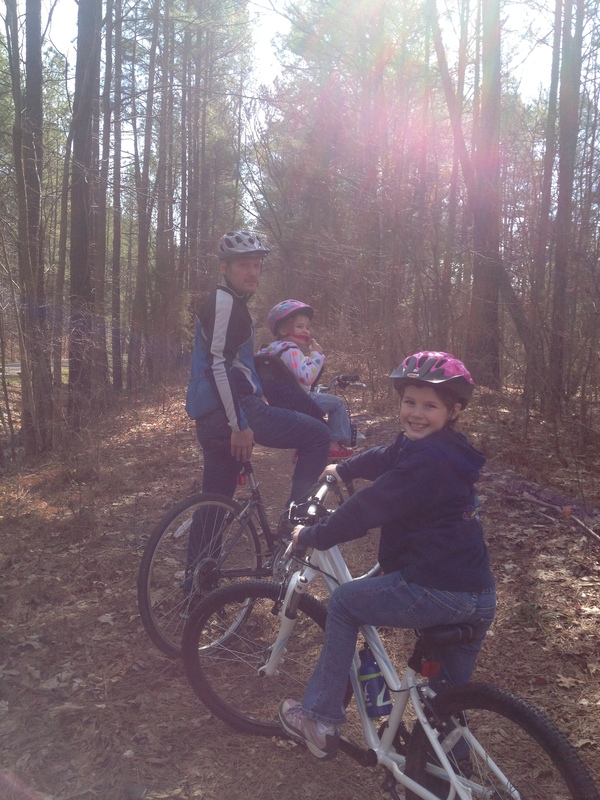 Today, my family hopped on our bikes to check it out. It was a bit like the Wild West out there with so many walkers and bikers enjoying this lovely (almost spring) day. I found myself amazed at the friendliness of trail-goers and also the confusion some seemed to have about trail etiquette. It got me thinking about how I learned the “rules of the road” for a community trail and how to share and care for it. For several years, I volunteered on the Appalachian Trail as an ATC Konnarock Crew Member, which meant working on a team with people I’d never met, out in the woods, often without running water, and having to hike in all the supplies and tools needed for that week’s project. I met many different kinds of trail users: thru hikers, section hikers, recreation hikers, distance runners, and families walking with their dogs. 1. Nature is cool. I want to promote a positive relationship with nature and animals and help my children see the role people play in keeping trails clean, animals safe, and taking care of our environment so that we continue to have natural spaces to enjoy. 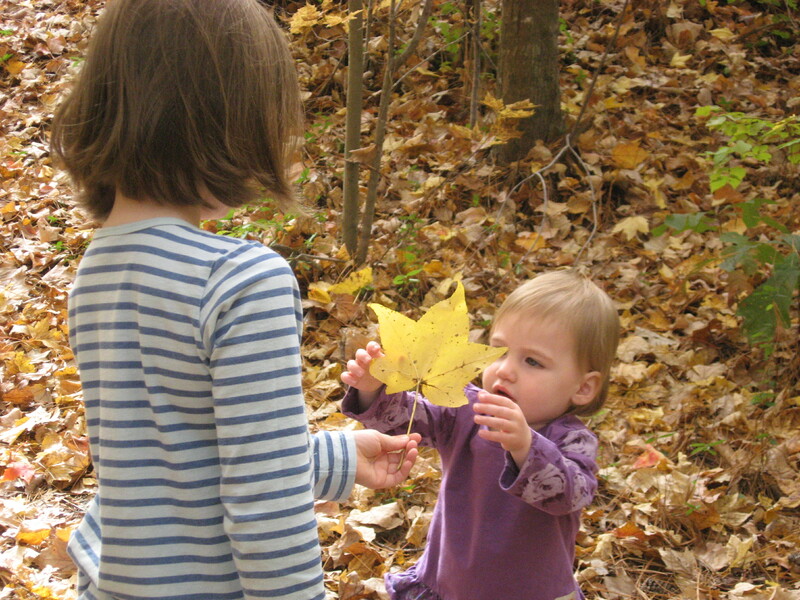 I try to help them notice what they see and hear all around them: a leaf, a flower, a squirrel, the sound of a running creek, birds singing or frogs croaking. I want to teach them to be curious by asking them questions and encouraging them to ask *me* questions. I also want to teach them what it means to be quiet and to listen and observe outdoors. We’re talking about bringing a small nature journal on our walks. They could look for the same tree or creek or section of trail and track what changes or even the different birds or animals that show up. (A good thing to do as we transition from winter to spring!). I also know that Forest View, like many of our Durham Public Schools (e.g., EK Powe), includes natural habitats and native plant gardens as part of outdoor science learning labs. 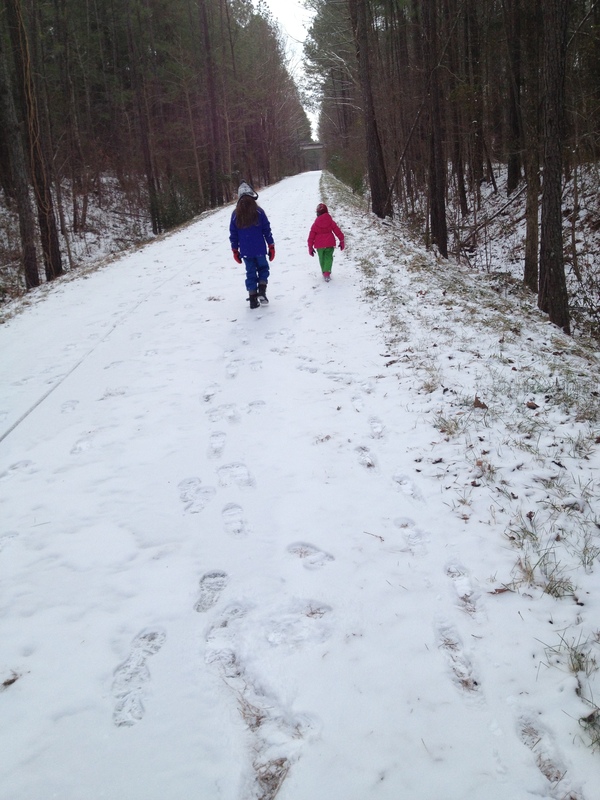 When my family’s on the American Tobacco Trail, I try to make connections to the school’s landscape, science projects and conversations, and field trips to the NC Botanical Gardens, Duke Gardens, New Hope Creek, and the Waller Farm. 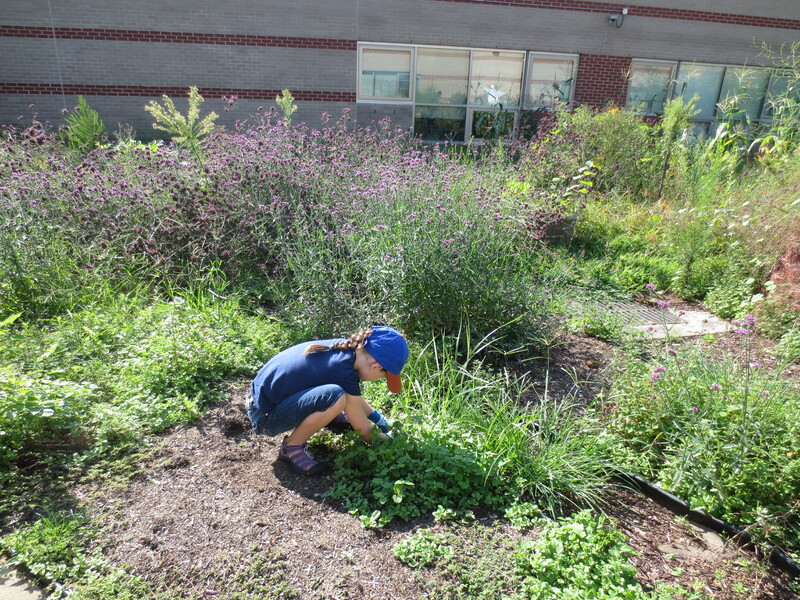 We try to volunteer as a family on outdoor garden and landscape days at the school, too. I also read Teaching Kids to Love the Earth for ideas. “Wheels yield to heels.” Bikers yield to those traveling on two or four feet. We may need to slow down or even STOP in high traffic areas. If we don’t share the road, people will get hurt. And everyone yields to horses. No one likes a Trail Bully! Just because people are biking or walking/running in a large group, doesn’t mean they own the trail. Sometimes groups need to slow down and wait for a chance to pass a slower rider or walker safely. No more than three wide on the trail when it’s crowded. 3. Stop Smart. If we need to stop or pull over for a rest or snack, we don’t block the trail. On the opening weekend for the ATT bridge over I-40, a family stopped in the middle of the bridge to have a picnic. While probably fun for that family, it caused serious problems for those trying to get around them on the bridge. 4. Leave No Trace (LNT). I had never heard of the LNT concept before volunteering on the Appalachian Trail, and now I try to follow the principles both on community trails and while camping. Pick up our trash. Respect wildlife. Stay on the trail to protect against erosion. Leave what we find growing so others can enjoy it. The American Tobacco Trail is our community trail, which means each of us has an opportunity and a responsibility to leave it as nice as—or better than—we found it. 5. Courtesy is contagious. This is our community trail. How do we want to treat each other? This morning my family had lots of friendly exchanges of “good morning” with fellow trail travelers. This is what I love about Durham. As responsible trail riders, I also want my kids to learn common courtesies like saying “on your left” if we are coming up on a slower rider or walker we need to pass and “thank you” if someone lets us know she is passing us. 6. Be prepared. We bring snacks, water, a small bag for trash, and tools to change a flat tire based on the size and types of bikes we have (Here’s how to change a flat). We plan in advance where we’ll be traveling and bring a cell phone in case we have an emergency or need to report any suspicious behavior. 7. Follow the Golden Rule! I try to remind my children (and myself!) to be patient and kind when we see others learning. We’re all learning something—whether it’s how to ride a bike, run a marathon, navigate the trail in a wheelchair, get a dog to heel, or the importance of waiting until it’s safe to cross the trail when you’re three years old and really, really, really needing to see the spider’s web on the other side. If we treat our trail as the community gem that it is, and treat each other with kindness and grace, then our trail will help us nurture our spirits as much as our physical well-being. We can show our children how vibrant, friendly, thoughtful, and nature-loving our community is and encourage them to live these ideals–and carry them forward–as they grow. Looking for more information about the trail? Here are some American Tobacco Trail Maps, directions to parking in Durham, and information about the NC Rail to Trails Program.